Michel Martin Reflects On Aftermath Of Navy SEAL William 'Ryan' Owens' Death Carryn Owens' husband was Navy SEAL William "Ryan" Owens, who died in Yemen in January. President Trump offered his condolences last week. Michel Martin reflects on the deconstruction of her grief. 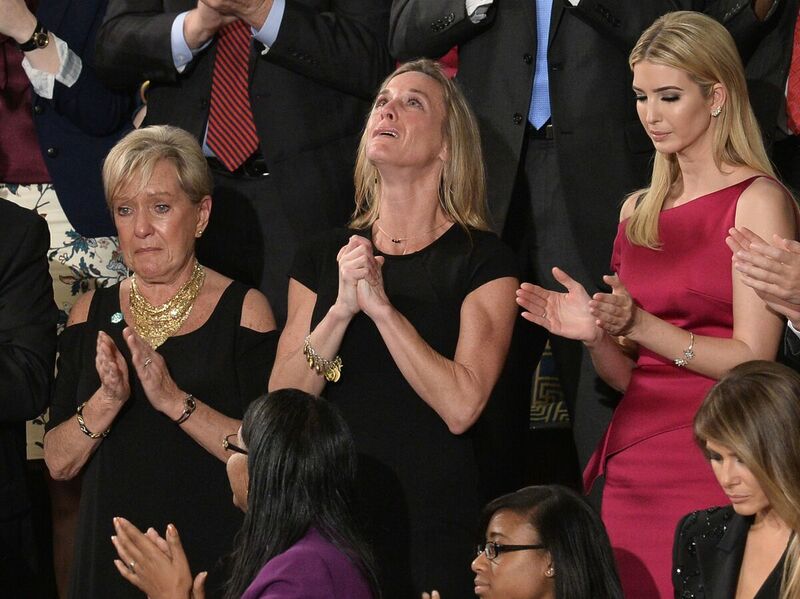 Carryn Owens, wife of Navy SEAL William "Ryan" Owens, is recognized as U.S. President Donald Trump addresses a joint session of Congress last Tuesday. I want to go back for a minute to Carryn Owens, who made such an impression at President Trump's address to Congress last Tuesday night. Her husband, Navy SEAL William "Ryan" Owens, died in Yemen in January. It was the first such mission approved by the Trump administration and the first ground mission in Yemen in years. According to the White House press secretary, the president decided to invite Carryn Owens to his speech when he called to offer his condolences. After giving it some thought, she decided to attend. By now a lot of other news has pushed this story from top of the mind but she is still on my mind for a number of reasons: Her obvious grief and her obvious strength were a vivid reminder of what we mean when we thank military men and women for their service; truly their families serve and sacrifice as well. But she is also on my mind because she reminds me that all who have lost someone too soon — to war, to suicide, to murder, to accidents — are bonded by a grief that is personal and yet universal. Her tears are ours; they fall from her eyes into the river of our own grief. We weep for her and for ourselves. I tried to imagine what she was going through in that moment — what that long ovation that must have felt like. An embrace? A tribute? Was it painful? Did she know that that brief time the spotlight was on her was a rare moment that brought forth empathy in this poisonous and polarized political moment? But then, of course, the politics and the poison did come: A Trump official felt the need to question whether some Democratic officials stood up long enough during the ovation. A blogger who reports on defense and intelligence matters reported that veterans he follows on social media were offended by what they saw as Trump's exploitation of a widow for his own benefit. A self described Democratic volunteer tweeted something mean and lost his job because of it. And on, and on like that. Now, some of that was likely set off by the president himself who went beyond acknowledging the loss of Chief Owens to use the speech to validate the mission itself — calling it highly successful and saying it generated vital intelligence. Others, including Chief Owens' father Bill Owens, question whether that is true. The elder Mr. Owens has called for an investigation into whether the raid should have gone forward at all in part because of questions over whether the President gave the matter his full attention and sufficient consideration. For his part, Mr. Trump has said he deferred to the military leadership. Those are fair questions and substantive ones. It is fair for any American to question any matter of policy carried out in the name of the American people. What is not fair — in my view — is to question the choice that any person makes, short of harming herself or others, about how to live through her grief; whether that person is Cindy Sheehan who camped out near President Bush's ranch in Crawford, Texas, in August 2005 to protest her son's death in Iraq, or the parents of Captain Khan who spoke at the Democratic convention last summer against anti Muslim rhetoric, or the parents of Trayvon Martin, who have begun organizing the parents of other teens killed by violence for weekends of mutual support — or Carryn Owens, who chose to accept Donald Trump's invitation to attend his first speech to Congress to accept the thanks of elected leaders. It is as if in this bizarre political moment, in which so many of our leaders strike us as inauthentic and perpetually performing, it is assumed that everyone else is too, and thus, anyone can be critiqued as if they were on stage in a play. But these families are not in a play. I bet they wish they were. I bet they wish that they could put down their programs, put on their coats and walk out the door and their respective nightmares would be over. But their nightmares will never be over. And it seems to be that the very least we can do is remember that fact and let their grief be their own.